Daniel Carrasco was born April 12th 1977 in Safford, Arizona. The six foot four inch right handed pitcher was a 26th round draft pick of the Baltimore Orioles in 1997. He began pitching in the minor leagues in 1998 & has pitched there in every season but three. He has a 36-36 minor league record with 51 saves & a 3.86 ERA in 275 appearances. In his long up & down career he was been signed & released by the Orioles, Cleveland Indians & Pittsburgh Pirates before landing with the Kansas City Royals in 2002. Carrasco pitched three seasons in Kansas City, he went 6-5 as a reliever in his rookie season of 2003 appearing in 50 games for the third place Royals who made a good run for the AL Central title all year. In 2005 he was used as a starter in 20 games going 6-8 with a 4.79 ERA, 49 strike outs, 51 walks in 149 innings pitched. He was released & then pitched in Japan for the Fukuoka Softbank Hawks in 2006. That winter he signed on with the Arizona Diamondbacks pitching in their minor leagues & learned the game of ping pong which he says helped revive his pitching career due to its mechanics. He was eventually released & signed on with the Chicago White Sox in 2008 where he returned to the major leagues after a two year absence. In 2009 he was 5-1 with the Sox posting a 3.76 ERA in 49 games. The journeyman ended up in Pittsburgh with the Pirates in 2010 before getting traded back to Arizona in July, along with Ryan Church & Bobby Crosby for Chris Snyder Pedro Ciriaco & cash. That winter he signed on with the New York Mets as a free agent. 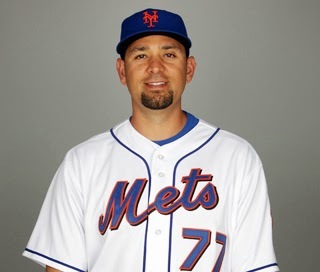 Carrasco debuted with the Mets on April 3rd, getting credit for a hold in a game at Florida against the Marlins. On April 10th he blew a save against the Nationals & then took a loss against the Atlanta Braves in a rare starting role. 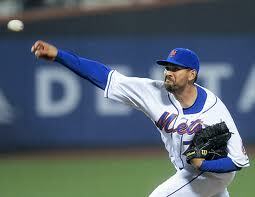 On June 16th he came on to pitch the tenth inning of a 8-8 tie game between the Mets & Braves at Turner Field. With runners on second & third he balked home the game winning run with Jason Heyward at the plate. The so called "balk off win" was the second ever allowed in Mets history. Carrasco continued to pitch out of the Mets bullpen in the 2011 season & on August 9th he finally earned his first Mets win. It came after one inning of relief at Citi Field in a game against the San Diego Padres. On the season he was 1-3 with two holds & a 6.02 ERA, allowing 67 hits in 49 innings in 42 games. In 2012 he twisted his ankle in Spring Training & did not make a bullpen spot, retiring at age 35. 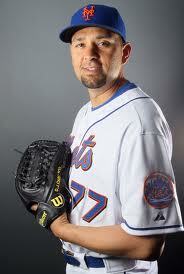 In his career he is 24-21 with a 4.48 ERA, 312 strike outs & 199 walks in 490 innings in 286 games.